Composite shingle is one of the most universal kinds of roof created on residential homes, these days. A composition shingle has an external layer prepared from an asphalt composition and underside part of shingle is created of fiberglass matting. The uncovered side is frequently coated with colored particles. Composition shingles are most preferred for roofing due to large number of properties of asphalt and fiberglass, like permanence and lightweight, making them appropriate for most roofing installations and weather conditions. Moreover the cost per square foot of composition slate roof shingles is lesser. Composition shingle roof is not smashed by weather changes and design does not let moisture upsurge. Through a composition shingle roof, you can have a variety of designs and colors to go well with your style and add more to the magnificence of your home. Composite shingle roof life is normally higher than asphalt shingles with manufacturers giving guarantees of up to 30 years. They are more reasonably priced than wood or slate. Composite roof shingles are light-weight and easier to load or lift up to height and will need a bit massive framework for installation. Composite roofing has improved fire-resistant properties. 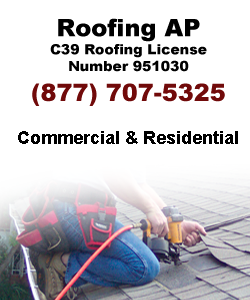 Install Composite Shingle in Los Angeles to enjoy plethora of roofing benefits.